Geographic profiling can be used effectively not just on serial violent crime, but also on serial property/volume crime. Crime and Intelligence Analysts, as well as Detectives and Investigators who regularly deal with serial property crime (auto theft, arson, break and enter, robbery etc. ), can benefit from training in geographic profiling. A two-week course in Geographic Profiling for Analysts and Investigators is available, structured as a theory week followed by a practice week. The first week of the course is a basic introduction to the concepts and theory of geographic profiling, and is generally open to all interested parties. It covers the mathematics and statistics behind the technique. Crime pattern theory, mental maps and criminal hunting area concepts are introduced. It examines how the results of Geographic Profiling can be applied to investigative work, influence search strategies and lead to more effective case analysis. The second week is a hands-on instructional course that focuses on applying geographic profiling techniques to actual cases (historical or active). This week of the course is frequently limited to law enforcement personnel. Emphasis is on effective analysis, strategy and scenario development and final report generation. The Rigel Analyst software is introduced and is used extensively in this part of the course. Some familiarity of GIS systems will be an asset, but is not essential. This course is approved by the Committee for Geographic Profiling Analyst Training and Certification (CGPATC), and graduates are eligible for certification as Geographic Profiling Analysts. The Advanced Geographic Profiling (AGP) course is intended to provide more comprehensive training to equip experienced Geographic Profiling Analysts with the additional skills to handle complex violent crime investigations, including counter-terrorism applications. Graduation from the basic GPA course and additional practical experience is a pre-requisite. In addition students should have prior experience with crime mapping and Geographical Information Systems (GIS), good computer skills, and basic mathematical competence. The AGP program curriculum includes readings (geographic profiling, environmental criminology, violent crime, mapping and cartography), classroom training, and case work. Various geographic and temporal analysis techniques are covered in addition to geographic profiling, as well as probability and statistics, linkage analysis and criminal profiling. ECRI provides online software tutorials for its products, including video demonstrations of how to use the software, and interactive tutorials with exercises using sample data (example: Rigel Workstation Video Tutorial). 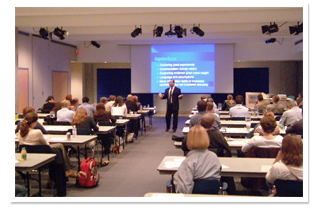 ECRI also offers short software familiarization courses over the internet or on site with an instructor.